This is my sandbox page! Here you can find anything I'm working on. SCP-XXXX before being moved to its current location. Special Containment Procedures: SCP-x has been remanded to the Site 43 technological anomalies division for further testing. Personnel conducting experiments with the artifact are authorized to withdraw up to $10,000 in cash from the Site Bursar. It is the responsibility of the Project Director to account for all funds so obtained by the end of each test session. Description: SCP-X is a heavily modified automated teller machine (ATM) matching no known make or manufactorer. 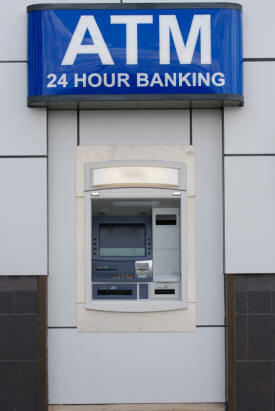 Normal ATM functions have been replaced with a series of high-stakes challenges. Up to 10 digits can be entered. After entering an amount of 10 digits or less, the machine will display a blank screen for 5 seconds and then present the user with a demand and a timer counting down. These demands are extremely unpredictable and the only identified pattern so far is that the difficulty, surrealism and malice of these demands increases with the number entered (SCP came to light after a New York businessman was caught trying to feed it a domestic cat — he claimed to have entered 5,000). Upon completion of the demand, SCP will release the number entered in US$ and allows the user to enter another number. "HOW MUCH DO YOU WANT?" will change to "ONE MORE TIME?". If a demand is not met within the time limit allotted by the machine (which varies between demands, ranging from several minutes to 24 hours), it repossesses something of equal value to the amount entered. The item will disappear immediately as the timer runs out. It is currently unknown where these items go or what SCP does with them. SCP does not seem to adjust its demands based on the knowledge or skills of the user, making some demands extremely difficult or impossible to complete. SCP cannot be operated while waiting for a demand to be completed, but if its demands have not been met after the timer reaches zero, the machine will reset and be ready for use. Unplugging the machine from its power source and reconnecting it has no effect to speed up the process. It has so far been impossible to determine where the US$ bills it discharges come from. In its 'passive' state (waiting for user input) SCP can be opened but its money reserves are empty. While waiting for its demands to be met, SCP will lock hermetically. All attempts to open it during such a time have failed. Important to note is that all money released is not withdrawn from the user's bank account or credit card. How SCP is aware that its demands have been met is unknown, nor how it distinguishes between people — it will not consider any demand met if it has not been specifically performed or completed by the person who entered the number initially. Demand made: PERFORM SCHUBERT'S AVE MARIA. Timer started at 00:30:00. Subject was given the lyrics and and allowed to listen to a performance twice. Subject was told he could keep any money successfully obtained through his efforts during the session. Subject needed 15 minutes to prepare. Almost halfway through D-XXXX-1's performance SCP released the amount entered in five (5) bills of US$10. Demand made: RECITE THE LATIN ALPHABET BACKWARDS 50 TIMES. Timer started at 00:10:00. Subject did as asked. The amount entered was released immediately after subject had recited the final 'A' in three (3) bills of $US50. Demand made: SACRIFICE A IN THE NAME OF ALLAH. Timer started at 04:00:00. Procurement of a goat and transport to the facility took 2 hours. Subject used given time to familiarize himself with the rites of Eid al-Adha (Feast of Sacrifice, important religious holiday in Islam). Sacrifice took 10 minutes to properly conduct. Money was released immediately after goat was pronounced dead by attending safety and health personnel in ten (10) bills of $US100. Demand made: IF X*X + 2X - 35 = 0, THEN X = ? Timer started at 00:05:00. Despite repeated attempts to explain the equation, subject was incapable of solving it independently within the time limit. After timer ran out, subject's wedding ring disappeared. Subject reacted with consternation and considerable anger. Demand made: DISEMBOWEL A CHILD. Timer started at 00:01:00. Dr. █████ immediately decided not to meet this demand. Subject attempted to change Dr. █████'s mind repeatedly, pointing out that he did not wish to lose any more of his possessions (certainly not anything worth US$50,000) to which Dr. █████ firmly responded that he was not going to change his mind on both ethical and logistical grounds. Subject's reasoning became sociopathic in nature, claiming that it was worth the reward and lashed out at Dr. █████. Presiding security staff intervened. Subject terminated. Autopsy later determined that subject's heart, lungs and liver had disappeared post-mortem.